This post is groundbreaking for me folks! Here is the reason why. In our home we have a special Family Night once a week (usually on Monday). The reason why we have this Family Night is to ensure that, no matter how crazy our lives get, we will always have at least one night were we connect as a family. This post is ground breaking because it is the first of my Family Night series. From here on out I plan to share great ideas, tips, and lessons that can be used to create a wonderful Family Night that your kids won’t forget. I will post weekly, so be sure to subscribe to my emails on my home page so you won’t miss out! I’ve already told you one reason why a Family Night is important. Here are 2 other reasons! 2. Stronger Family Roots and Traditions. Being consistent and making special time for your family each week tells your kids how important family is. It helps to establish deep roots that will last forever. I grew up in a family who had 1 Family Night a week. I don’t remember everything we learned but I remember spending time together and bonding from that time. To this day, I am very close to all of my 7 siblings and we are now passing on this same tradition to our own families! OK! Now we get to the FUN part! 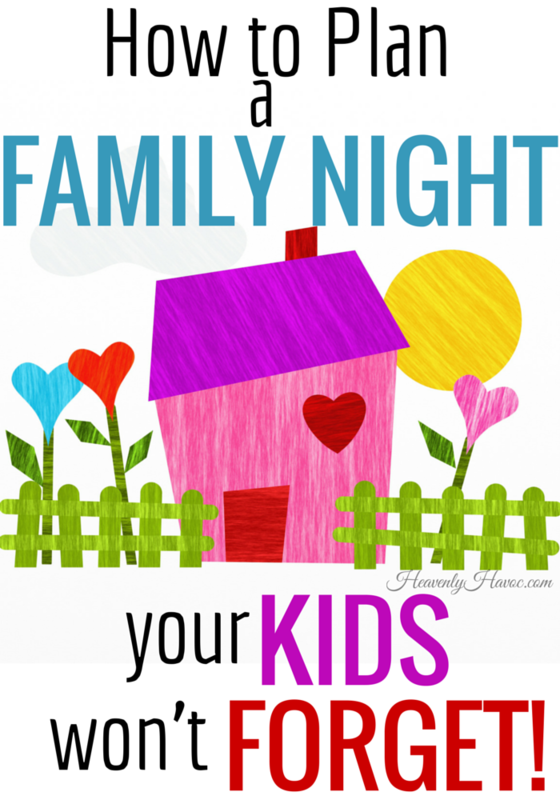 How to plan a Family Night that your kid’s won’t forget! In order to get your family to WANT to jump on board with this idea, you need to make it FUN and MEMORABLE! IF you are just starting out, the first few weeks are crucial to your success. Here are 6 ways I have found to have success! 1. Plan ahead! Set aside 1 day a month (I love Sundays for this!) and plan out just 4 weeks. It’s really simple. Just think of 4 things you want to teach your family and write them down. Then go from there! If you’re not a planner or you’re not good at this kind of thing, then tag a long with me each week and I’ll give you great ideas! 2. Get the whole family involved! Give every one a job or assignment. At our house, one person says the prayer to start us out, one person picks a fun song for us to sing, one person plans a (very short) game, etc. YOU pick what works for YOUR family and just GO with it! Remember, HOW you do your Family Night is not as important as the fact that you are DOING IT! Don’t get too caught up in the process. 3. Change it up! Some nights you might want to have a lesson and teach your family important values. Other nights, you might just want to have a fun outing or activity. Be excited, keep it fun, and be consistent and your family will follow your lead! If you are pessimistic and act like a drill sergeant, no one is gonna love Family Night in your house! 4. Timing. Make sure that the LENGTH of your lessons is appropriate for the age of your kids. For example, if you want to teach your kids the value of being honest, and your kids are 5, 3, and 1, you will want to keep your lesson 5 minutes or less. Try and aim for a minute for each year. If your oldest is 12 and your youngest is 2, either trim your lesson in half to 6 minutes or make sure you have something to entertain the youngest while the older ones are still (hopefully) trying to listen. Trust me on this! If you’re lesson is way too long, you will lose them! Sometimes the 2 yr old makes everyone laugh hysterically and no one can listen to Dad’s lesson. Other times, family prayer feels like a joke when everyone opens their eyes to see if someone else is peeking during the prayer, or kids are snickering, lying face down on the floor, and just plain not cooperating. It happens. It’s ok. Just shrug it off and keep on trying. One night might not seem like it’s making a difference, but eventually that ONE night turns into many. Just like many brushstrokes on a canvas eventually make a beautiful painting, your efforts in uniting your family will create memories to last a lifetime! Your attempts at a lesson might be a flop, but, let’s face it, if the TREAT is awesome, all will be well! Here is my challenge to you! If you haven’t already, set apart one night a week to do something special with your family. Be firm in this decision, as it will be easy to cast this night aside when life gets stressful of hard. Stick to your goal! Even if you only have a quick gathering that lasts 15 minutes, stick to it! I promise that in time, this decision will be one of the greatest you ever make for your family! What have you got to lose? Start today!